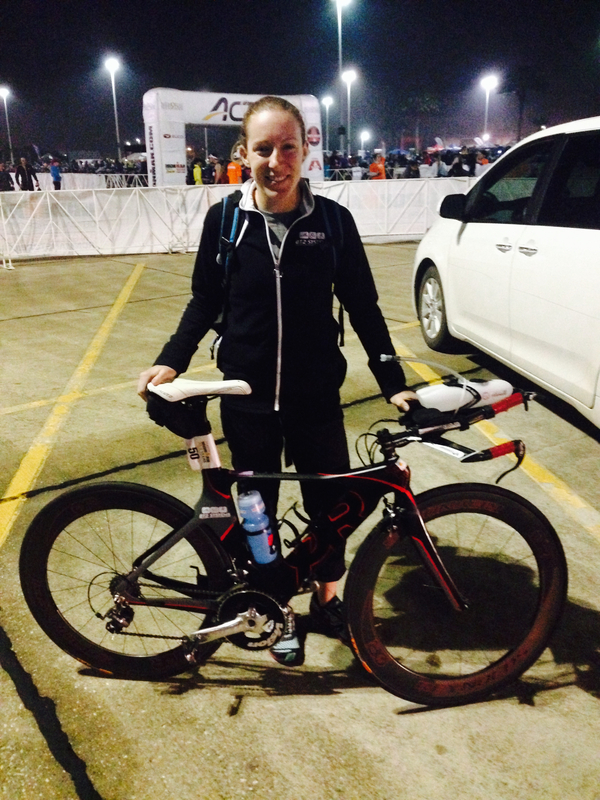 I kicked off the 2014 season with Ironman 70.3 Texas, held in Galveston. I did this race last year, and was happy to see it was a QT2 key race again this year. 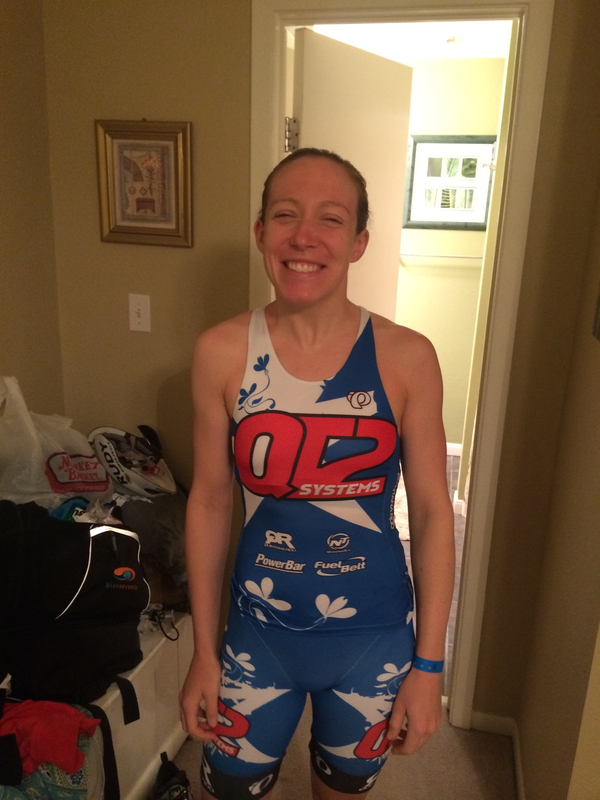 Last year it was my first race with QT2, where I got to meet a ton of my new teammates. 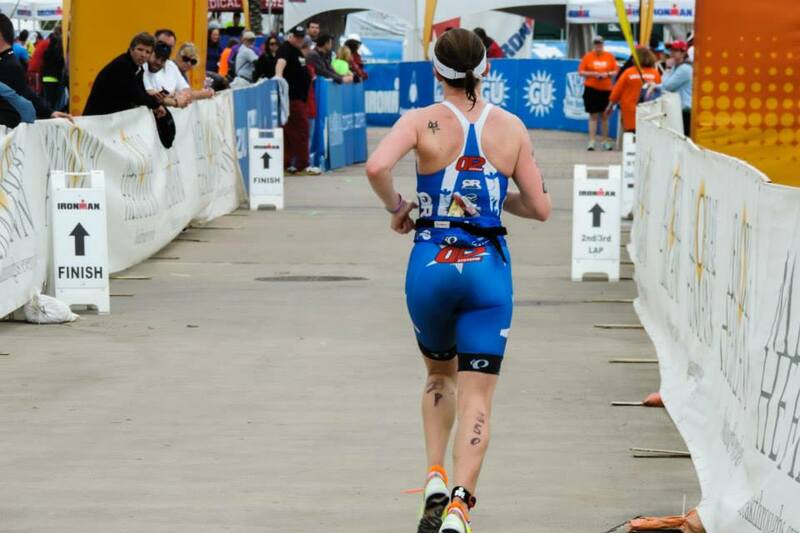 This year, the race also had some significance – it was my first race competing as a Pro! As I mentioned in my last post, the weather forecast for race day was not so good. I expected to wake up to pouring rain, howling wind, and maybe even some rumbles of thunder, but it was surprisingly quiet out. I could hear the wind a bit, but no rain or thunderstorms. Well, the forecast said this would go on all day, so I wasn’t too optimistic. But what was I going to do about it? Mother Nature was going to have her way, so I just needed to roll with whatever weather was brought upon us. My alarm went off and I woke up feeling excited to race. Less nervous than I thought I would be, I just felt…ready. It had been 6 months since my last triathlon, and I was itching to make up from a somewhat disappointing race in Vegas last year. I also felt like if I had a good day out there, if I executed this race the way I know I can, then I could be IN the race. Not just a participant in the pro division, but be able to actually race! Of course doubts crept into my head, but I was able to push them aside enough to focus on the work that needed to be done that day. Tim & Jesse had helped me get to a great place physically and mentally, so I felt ready to race hard. Morning squinty face. New kits are awesome! Race morning – ready to roll! Time passed quickly, and all of a sudden, it was time for me to start the long walk to the pier, where the swim starts. I was so lucky to have Matt there with me in the morning, to keep me focused but relaxed. He helped me in my wetsuit, gave me one last pep talk, and then it was time to go! The male and female Pro’s got in the water a little before 7am, just as the sun was coming up. I was able to get in about 10 minutes of warming up before it was time to line up at the buoys, which helped a lot since both the air and water were not very warm. The water was pretty choppy, definitely the choppiest conditions I’ve had to swim in so far. Ever since camp, I’ve felt very confident in my swim. It seems my speed is coming back from my good ol’ sprinter days, and my TT times were the best I’ve seen in a while. I’ve felt strong and fast in most of my swim sessions over the past month. Me and the water have been friends again. So, the goal of the swim was to use some of that speed to get out quick and get on some feet. The benefits of drafting on the swim are huge, so I needed to get behind some fast girls as quickly as possible. To do this, I need to have an aggressive swim start. In the past, this part of the race tended to freak me out a little – I want to be back in the pool with my own lane! I’ve let this get to me, and let myself get pushed around at the beginning of the race. Not this time! I was feeling confident that I could swim with these girls and I needed to get in the race right from the start. The men set off, and we gathered at the buoys. Not much different from other swim starts, just a few less people! Oh, and everyone was prepared to go out fast and push the swim. In the AG race, this is typically a smaller sub-group of the whole, that are really out being aggressive on the swim. 4 minutes after the men, the gun went off….I put my head down and started to swim as hard as I possibly could. I got a few strokes in before I seemed to be boxed in by the girls on either side of me. I tried to push my way through but I wasn’t making much progress. I saw an opportunity to make a move and go around one side. This turned out to be the best thing I could have done…I passed those girls and found the feet of the group ahead of me. This would be the lead pack (with Amy Marsh leading the way about a minute ahead of our group). We navigated our way into the waves on the way out to the first turn buoy – the water was rough! I was glad to have been thinking more about faster turnover in my swim stroke over the past year, which made swimming into the churn a little more efficient. By the first turn buoy, there was a group of 4 of us, that would stay together the rest of the swim…I was in the middle of the group, and able to take advantage of drafting. The back stretch was much faster, and the final 400 was navigating again through some waves hitting us from the side (that was fun since that was the side I favor for breathing…). I tried to make a move in the last 200-300, but couldn’t quite get enough speed to pass anyone. I stayed where I was, and came out of the water in 4th. Final time: 27:16, which may not have been my fastest swim by time, but given the conditions and my tactical execution, I’d say it was my best triathlon swim to date. Into T1, out of T1…a bit faster than I’ve been in the past, but still have some work to do here. The first few miles of the bike are a bunch of turns out to the really flat and straight out and back along the water. We had a ridiculous tail wind on the way out…I looked at my watch and I was going 30 mph, which was only comfortably hard. I was in the race, and wanted to take advantage of the wind, so I rode hard for the first half. I passed and was passed a couple times. My biking is improving, and I’m beginning to be able to stay in the bike race more now. My legs felt strong, and my new set up on my QR CDO.1 felt powerful and comfortable. As soon as I hit the turnaround, I also hit the wall of wind. The first 5 miles back were brutal. Pelting rain and strong headwind. But the wind began to ease up and the rain stopped, so the rest of it was not that bad. The final 10 miles were a bit tough for me. I think I was losing a little focus, worrying if I had biked too hard to be able to run well…a few more girls passed me and I couldn’t quite stay with them. Even so, I was rolling in at a decent pace, until about 2.5 miles from the finish. My front tire went totally flat!!! I was so annoyed…there was no way I was going to spend 5+ minutes changing my tire when I was so close. I made the decision to ride it in, which made the final few miles a bit treacherous (turning and bumps were no beuno with a completely flat front tire!) and I’m sure my wheel didn’t appreciate it too much. The ka-clunk, ka-clunk going over the bumps at the airport made me sad for my poor wheel!! But, I made it back, and probably only lost a minute or two and a place or two. Now it was time for my favorite part of the race, the run! Rolling into T2. Check out that flat front tire…yikes. T2 was pretty empty when I got there. The girls who had passed me late in the bike were already out on the run, and there was no one close behind me. I didn’t know exactly where I was in the standings (Matt would later inform me I was in 11th), but I knew I had my work cut out for me. I know my run is competitive in the pro field, but I didn’t know how much time I had lost on the bike. One by one, I started picking off the girls ahead of me. By lap two, I had (unknowingly) moved into 7th. The first loop was pretty empty, with only pros and a few faster age groupers in earlier waves, but lap two started bringing in the masses. It was much harder to see where I was in relation to the rest of the pro field. The course has a bunch of out and backs, so I could sometimes see who was in front of me. And of course, Matt was out there giving me updates as I passed – it was so great to see him multiple times on each lap! I looked forward to seeing him every time we passed through transition. I passed one more girl in lap 2, which bumped me up into 5th. The final lap came quickly, and I was starting to fatigue a bit…but I knew I had to give it everything I got in the last few miles. I had to dig deep and hold on. I wasn’t gaining on 4th (we actually ended up running about the same time), but there wasn’t anyone catching me from behind either. Rounding the final turn to the finish! Final time: 1:24, About 30 seconds slower than last year, but coming off a much harder bike, and more steady pacing with increasing HR throughout. Finishing the race, I was happy with my performance and knew it was a PR time, but it took a few minutes for it to sink in that I had come in 5th, a podium spot. Coming into the race, I realistically thought it would be great if I could get top 10. Obviously, I always hope for more, but being my first race in the pro field, I really didn’t know how I would stack up. So, I was thrilled with 5th! I got to share the podium with some amazingly talented triathletes. With the exception of a few minor issues, I was pleased in my execution of race day. Fellow QT2 pro Amanda also grabbed a top 10 spot, and I got to see her a bunch of times out on the run course which was awesome! All of QT2 represented well in our first team race of the season – lots of podiums & fast times! Our new Pearl Izumi kits are great, and really stand out on the course. After feeding our faces at the Ironman TriClub tent (thanks to them for their hospitality – the food was just what we needed for the long wait before awards, and the beer was just what we wanted to celebrate finishing! ), and attending awards, we headed back to our Jamaica Beach house, and spent the rest of the night out at The Spot with the rest of the QT2 athletes. It was a great way to unwind after a hard day of racing. Thank you to everyone for the support before, during, and after the race. I feel so lucky to have people in my life that want to help support my goals & dreams in the sport and life! I enjoyed my celebratory beer and ice cream, had a couple of easy recovery days, and now it’s back to the grind! I have some work to do before my next race on May 3 – Ironman 70.3 St. George, which is also the US Pro Championship. That means there will be serious competition out there! I’m looking forward to racing out in Utah – I’ve heard the course is tough, but beautiful. Will be very different from pancake-flat Texas, but a good challenge!